The Turn Box family is a very stable and compact knife sharpening system. It works well in the kitchen and it quickly breaks down for storage in a drawer. The turn box family of knife sharpeners is also great for outdoorsmen on the go because it is lightweight and stores easily into a backpack. It only takes a few swipes to maintain an edge. There are two pre-set knife sharpening angles in the wood block 20 degree and 25 degree. This two stage knife sharpening system features a hardwood turn box with internal rod storage in the base, two 5" long medium diamond rods (600 grit), and two 5" long fine ceramic rods (1000 grit). 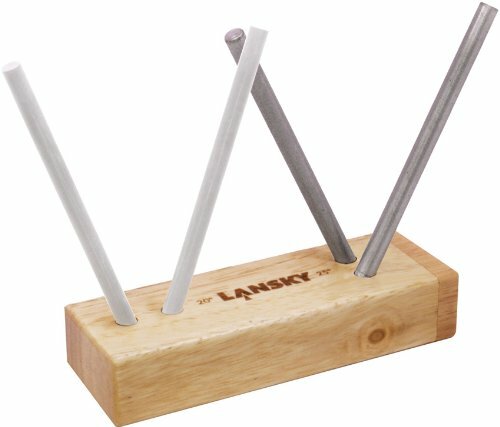 If you have any questions about this product by Lansky, contact us by completing and submitting the form below. If you are looking for a specif part number, please include it with your message.